I decided for SQL Rally Amsterdam, because it is new, and because I promised the Dutch Chapter leader to hand in a session. So this year no SQL Rally Nordic. Having spoken at already 7 conference this year, including 1.5 days of PreCon (www.andreas-wolter.com/sql-conferences/sql-conferences-2013.htm ) + 3 more coming up (PASS Summit Charlotte USA, TechNet Berlin Germany, PASS Camp Darmstadt Germany), 11 conferences in 2013 really is a lot. Also considering once in a while my customers are actually happy if I have time for them :-). 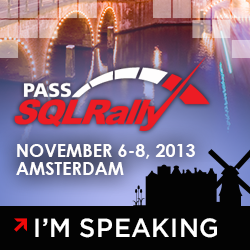 SQL Rally Amsterdam offers a choice of 5 (!) real high quality PreCons on Nov. 6th and 3 parallel session tracks on Nov. 7th-8th. : BI Platform Architecture, Development and Administration, Enterprise Database Administration and Deployment, Database and Application Development with many well-known international speakers, MCMs and MVPs. I will be presenting “SQL Attack(ed)” – SQL Server Under Attack. A demo-loaded security session featuring 2 newly developed privilege elevation and DoS-attack techniques, executed via SQL-Injection, that I personally developed this summer in preparation of SQLSaturday Germany/Rheinland and also shown at SQLSaturday in Istanbul. So if you want to see some reasons for taking security measures like permissions serious, live and in action, check it out!